I’m still on a morning smoothie kick with the hot weather we’ve been having! This one included an entire romaine heart, avocado, frozen banana, organic frozen mixed berries, vanilla, raw cacao powder, cinnamon, water and ice. The flavor of romaine doesn’t disappear into the smoothie the way spinach does, but it was quite refreshing! I’ve been breaking my “lunch” up into two smaller meals lately, because my appetite just isn’t as large as it used to be. (My stomach is growing, but the room in there is shrinking!) I started off the early afternoon with a bowl of fresh blueberries, followed a little bit later by a bowl of chia pudding. 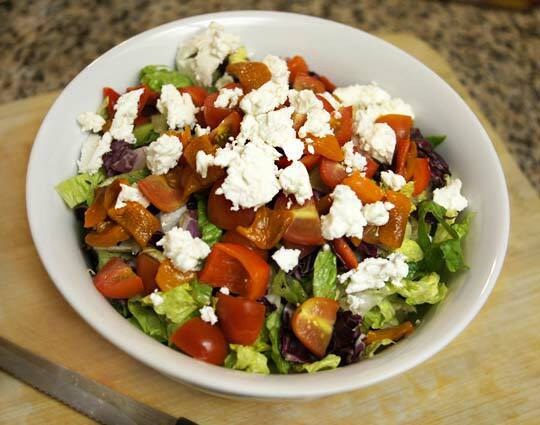 Later in the afternoon, I had a large romaine salad, topped with roasted bell peppers, tomatoes, goat cheese and a lemon dressing. We’ve been going to birth preparation classes each week, so we ended up dining out after our class. 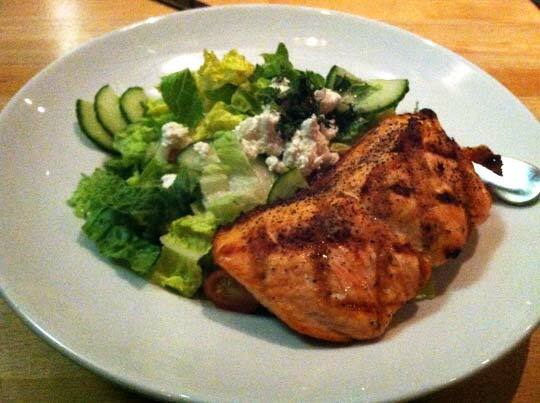 I had a large salad topped with cucumbers, cherry tomatoes, feta, and wild-caught salmon. 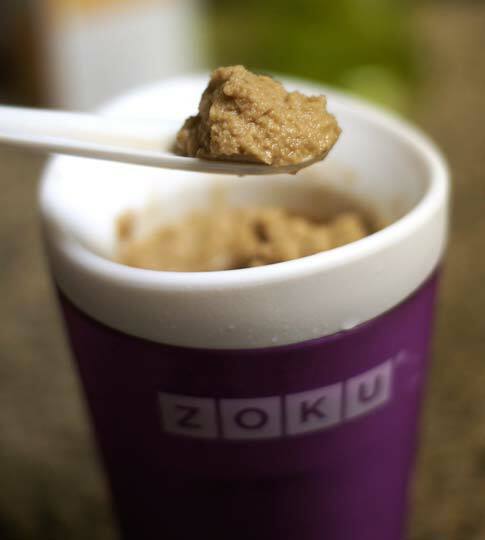 I picked up one of these Zoku Slush & Shake makers to see if they were really as cool as they sounded. You simply pour a cold liquid into the pre-chilled cup, and within 7 minutes, you have a slushie! I used a homemade chocolate coconut milk as the liquid, so the results were delicious. I love your Classic Green Smoothie, I made it the other morning before my Total Conditioning class. The slush is maker looks cool! I make a fabulous Chocolate avocado pudding… So smooth and yummy. I do not tell beforehand what’s in it because some will turn up their nose ! If anyone interested, I will share my version. It’s gluten/dairy free. It’s a pretty fun gadget so far! I like how it keeps freezing the slushie as you eat, so it doesn’t get as liquid-y as my slushies from the Vitamix. But, I’m only willing to buy two of them, so if we have more than two people in our house, I still have to use the Vitamix to make enough for everyone! I’ve never tried avocado in my green smoothies, but from the looks of yours I now HAVE to try it! Looks amazing! 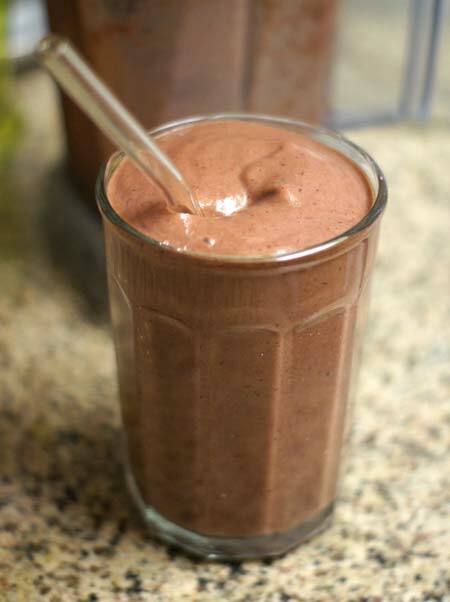 do it – it’s one of my favourites for shakes and smoothies!!! Oooh everything looks super yummy! Do you use a Vitamix for your smoothies? Best wishes to you and the bun-in-the-oven! Yes, I love my Vitamix! 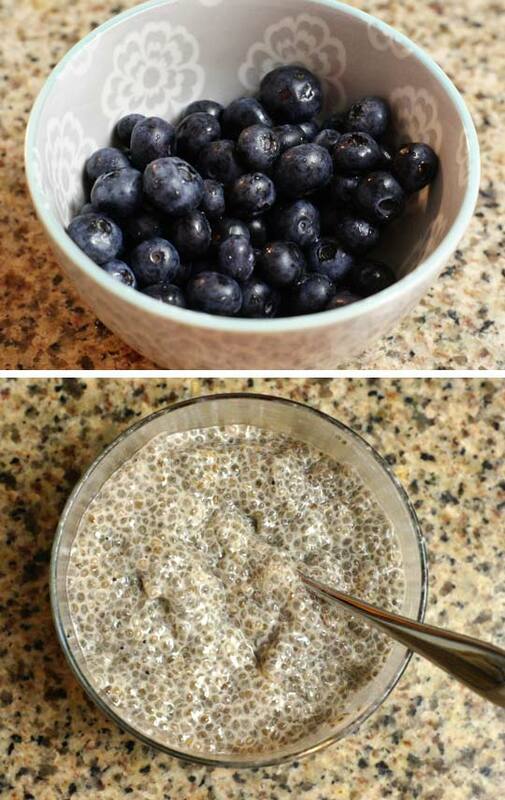 Tried your chia pudding this morning and LOVED it! I doubled the recipe and divided it up in tupperware for a quick grab and go breakfast. Thank you. Thanks for the inspiration! Very interested in you favorite measurements for each ing. so I can try the smoothie! Please, please, please let us know! When you go out to dine, do you always go to restaurants that cook with organic ingredients? We don’t always require that of our restaurants, but this particular restaurant does only use organic ingredients. And luckily, restaurants that serve mostly local and organic ingredients are quite easy to find here in LA! Hi Colleen! When you freeze bananas it is best to peel and slice them before freezing. Doing so eliminates the issue you had. I prefer to line a cookie tray with parchment paper or a Silpat mat and then place a tray of sliced bananas in the freezer. Once frozen, I place them in a Ziploc bag or an airtight glass jar. Hope this helps. Yes, definitely peel the bananas before freezing! As soon as my bananas are ripe with spots on the skin, I peel and store them all in a glass tupperware. Place the tupperware in the freezer, and they should all be frozen by the next day! I’m going to look up that slushy maker. That looks really neat! I’m on a big smoothie kick too! They’re soooo good and I love the fact that you can throw almost anything into it! I have been eating so much chia pudding as well. Such a yummy dessert! I’ve been obsessed with chia pudding lately. It kills my oatmeal craving but I love how it’s cold. Perfect for summer! That slushie maker looks awesome! My daughter and I love to freeze juice or milk cubes and blend them for ‘slushies’. Do you think it works better than a blender? I would say my Vitamix is still faster than the slushie maker– you have to scrape down the sides of the Zoku for about 7 minutes to create a “slushie.” However, it’s nice not needing to use ice get the same consistency, and it would be perfect for someone who can’t make a slushie in a less-powerful blender. Everything looks delicious – especially that salmon! Wow that slushie maker seems awesome! I want to pick one up! I’m on Day 3 of a juice fast right now. Juice, juice and more juice…I’m feeling great but pictures of delicious foods don’t help. Maybe I should stay off the blogs for a bit. And off Pinterest! Would you mind sharing the amount of each ingredient in your smoothie? Thank you! I didn’t measure the amounts, but I’ll try to post a recipe for it in the near future!